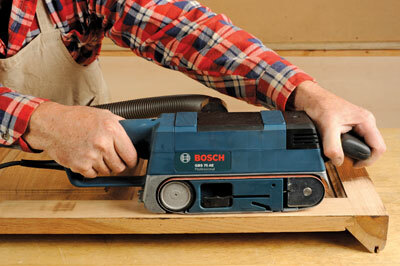 Hold on tight as we go for a spin with this Bosch sander and give it a belting. Will it leave all the other machines for dust? Anthony Bailey gives it to you straight! It is somewhat surprising that given the extraordinary range and variety of Bosch Blue power tools, the GBS 75 AE belt sander is currently the sole example of a belt sander. One would expect it to have a 100mm belt width big brother, as rather a lot depends on the performance of this machine, when the competition such as Makita have always fielded wider belt models. Narrow machines generally work well but you can easily dig ruts if you aren't careful. The outfit comes complete with a static sanding base which the belt sander is fitted into, so it is rigidly fixed either horizontally or vertically. Two clamps then hold the base down to the bench top or Workmate. In this mode you can also add the supplied longitudinal fence which can be tilted for bevel sanding. The variable speed control is located in the switch trigger which can be locked on. The GBS 75 AE comes with just one 80 grit belt which was what we used in the test. It is easy to fit; although the de-tension lever is a tough plastic, the belt barely required any tracking to align it. You can pick from a wide range of Bosch branded abrasives from 40-150 grit. 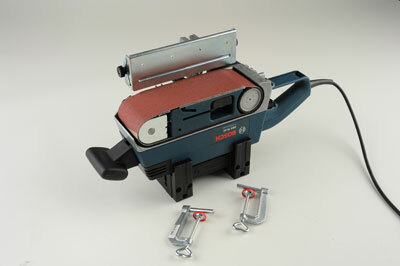 An accessory sanding frame is available which prevents dig-in, especially when sanding critical surfaces. Considering the 80 grit was quite 'keen' this machine was quite well behaved, but I would be happier with the sanding frame in place where a 100mm wide model tends to sit flatter without help. Extraction is much preferable to just using the provided dustbag. Overall this is a decent machine that can even be used vertically if needed as it isn't too heavy.